John Cotton was born in Derby on 4th December 1584, eldest of 3 sons of Rowland Cotton, a Derby lawyer. The young cotton recieved his education at the old Derby Grammer school in St Peter's Churchyard, then under the leadership of Richard Johnson. He is one of the earliest pupils, 1593-97, for whom there is a record. Cotton proceeded to Trinity College Cambridge, later going to Emmanuel College where after his ordination in 1610, he had a brilliant academic career becoming a senior lecturer and dean. At the age of 27 he was appointed vicar of St Botolph's church in Boston, Lincolnshire, returning to Derby once a year to see his family. Whilst at Boston he became increasingly Puritan in his beliefs, gradually removing certain Anglican ceremonies from his services, leading him into conflict with the church authorities. Being summoned to appear before the Court of the High Commission he decided to leave for America in 1633. 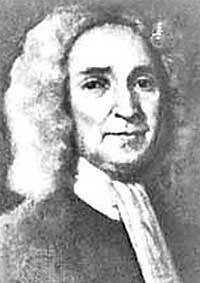 He became a major civil and religious leader in New England and founder of the city of Boston USA. He wrote many books and papers which helped to shape life in the colonies but as he grew older, his religious views became more extreme. He lacked faith in his fellow men and supported oligarchial rule. He never returned to England, though his books were published in London.